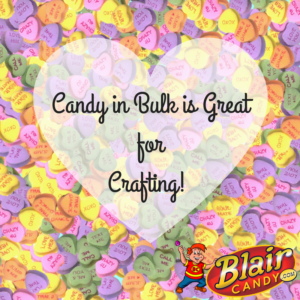 Valentine’s Day Candy in Bulk Makes Great Craft Supplies! While Valentine’s Day Candy is a fun snack during the time leading up to Valentine’s Day, you can also make some very neat crafts with it! There are plenty of DIY decorations that are very simple and use candy and items you probably already have around the house. For example, this heart shaped wreath uses candy, hot glue, and ribbon. The only items you’ll probably need are the candy and foam wreath! Or check out these center pieces that use Valentine’s candy in bulk. For some, all you need is candy and glassware that you have in your cupboard. For more ideas on how to use candy in bulk for decorations or gifting, check our previous blog posts or follow us on Twitter!